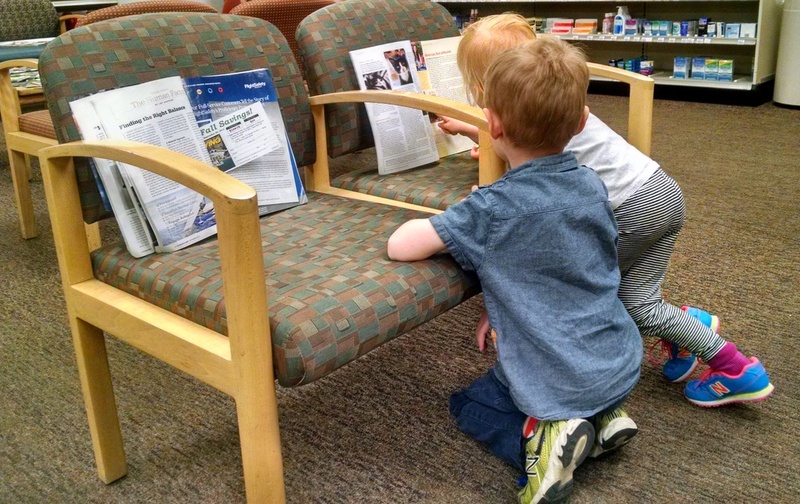 Kids reading magazines at the pharmacy. Went to our HMO’s Urgent Care twice. Called the nurse hotline three times. Visited the doctor’s office three times. Learned you can get canker sores on your uvula. Thankfully we have good insurance. All of the illness and related appointments made it so we weren’t able to leave for our trip as soon as expected. After we’d established that no one had anything life threatening, we decided to still go on the trip, just a day late. (This happened last year too, hopefully this won’t become a trend.) We weren’t really better, but the snowy weather was bumming us out and we figured we might as well be sick somewhere warm. Our drive out of town. Noel going down the slide in Parachute. As we got farther from home, the skies cleared and our spirits lifted. We stopped at a rest stop/park in Parachute and everyone shed their down coats and enjoyed the sun. Hanging out in the hammock. A bunch of turkeys running past our tents. It was a long day of driving, but we made it to Capitol Reef just before dinner time. We were meeting up with the Walker clan and my parents. Hope and Joe were heading out that night so we only got to spend a few hours with them, but it was so nice to see them. 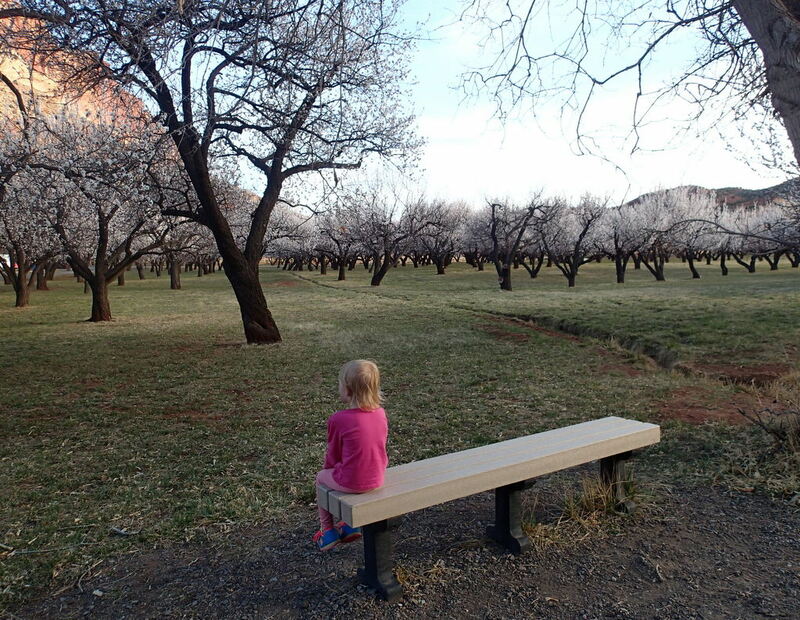 The fruit orchards were in bloom and we had fun singing a couple of rounds of “Popcorn Popping on the Apricot Tree.” Blossoming trees and red rock are some of my favorite things, so this part of the trip did my heart good. Hope, Joe, and Porter stayed until after dinner and we almost got to a point where Porter wasn’t completely terrified of us. At the very least, he was brave enough to take Cheetos from us. Cooper posing in front of Hickman Bridge. Ellen laying the sand after refusing to walk on it. The next day we went on a little hike with my parents to Hickman Bridge. It was good to get out, but for the first time ever Noel and I found our hiking capabilities to only be as good as the kids.’ Turns out we were more worn out than we thought. The kids had a blast with my parents and we were all sad to say goodbye to them after a brief picnic. As for us, we headed South to Escalante Petrified Forest State Park to continue our trip. 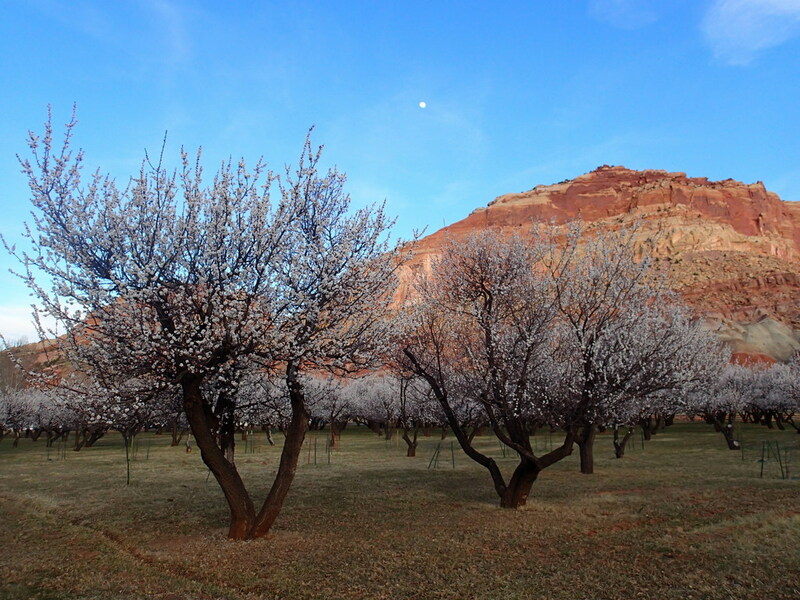 This was our first visit to Capitol Reef and we’re definitely going back to hopefully see more next time. We set up camp in Escalante and had a delicious dinner of rice, salmon, and asparagus. After roasting some marshmallows, we all took warm showers and went to bed. We all stayed warm and were relatively comfortable, but our sleep was still restless since we were all coughing and sniffling. Kids holding hands as they walk under an arch. Noel assisting Ellen off a rock. The next day, we took the kids to Devil’s Garden in the Grand Staircase Escalante National Monument. The kids loved the self-direction we gave them to climb and explore and probably put in more miles than if we’d been on a trail. We played there for quite awhile before the wind picked up and blew sand in everyone’s eyes. 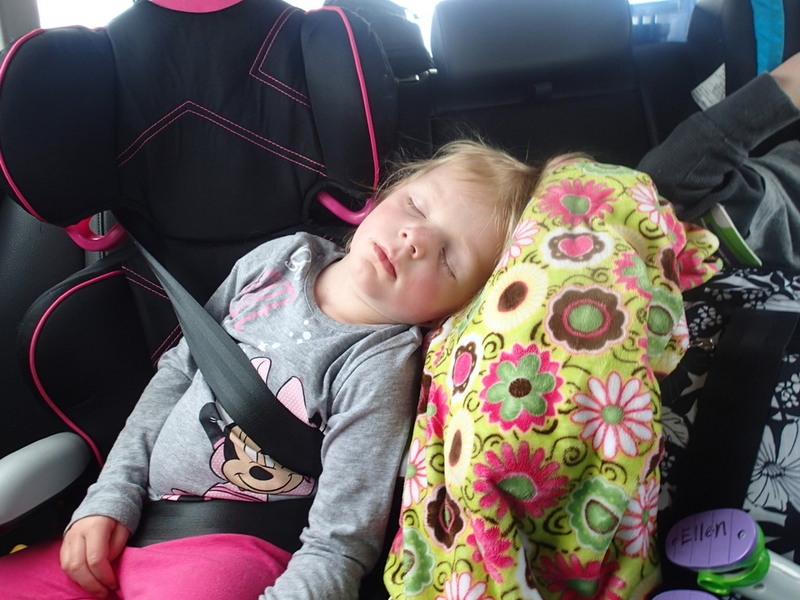 We headed back to the State Park and let Ellen take a much needed nap in the car. 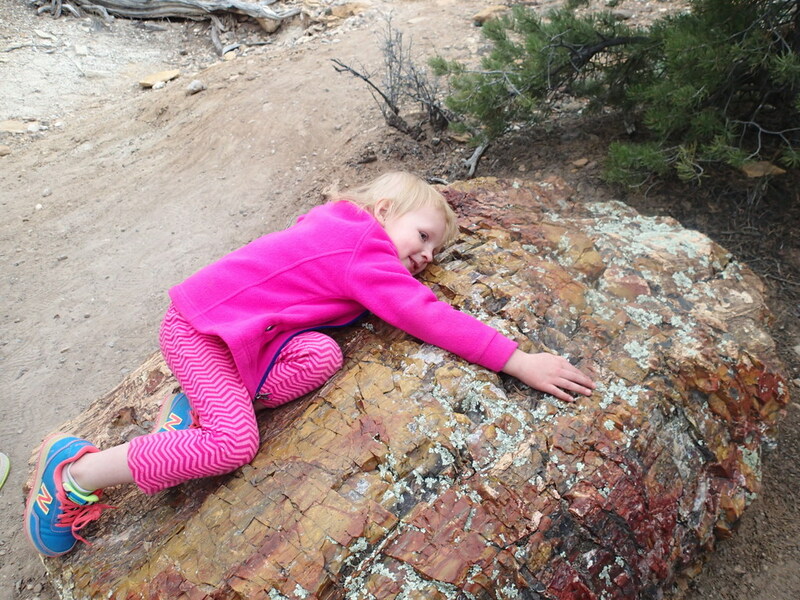 Before we left, we knew we needed to check out the petrified wood. I’d read about it on my friend’s travel blog, 51 Cent Adventures, and knew we needed to check it out. The hike (Petrified Forest Trail and Trail of Sleeping Rainbows) was supposedly only 1.75 miles, but it felt much longer. Whether that was because it actually was or because we were kind of rundown, we may never know. Ellen and a petrified stump. That was our last night camping and we were all so ready to go home, eat ice cream, chill, and sleep in our own beds. The second I woke up I started packing up sleeping bags and pads. By the time Noel woke up (he’d moved to the car because he couldn’t stop coughing when he was lying down) I’d packed everything the kids weren’t sleeping on. (We are blessed with sound sleepers.) Generally when we camp we are the last people to leave the campground, but that day we were the first to leave. Before heading home, we stopped at Hell’s Backbone Grill in Boulder, UT. When we were first married we would wake up to Utah Public Radio, and at that time Hell’s Backbone Grill was one of their sponsors. Sometimes they would read the menu items and Noel and I would salivate longingly. We really wanted to eat there when we did our backpacking trip back in 2009, but we felt pretty scraggly by the time we were done and not really restaurant appropriate. While our kids are not necessarily restaurant appropriate, really ever, we decided to risk it and gave them a nice long talk about how they needed to behave themselves and not do things like throw fits or plates around. The food was amazing and really ended the trip on a positive note. They’d only been open for the season for a day or two so the staff was getting back into the routine. They were all very welcoming though and when our breakfast took a little longer than expected they more than placated us with some free streusel-topped apple cake. When the breakfast arrived, it was indeed heavenly. We made it home safely on sunny, clear roads. After eating soup and popsicles, we slept amazingly with all of our humidifiers going. 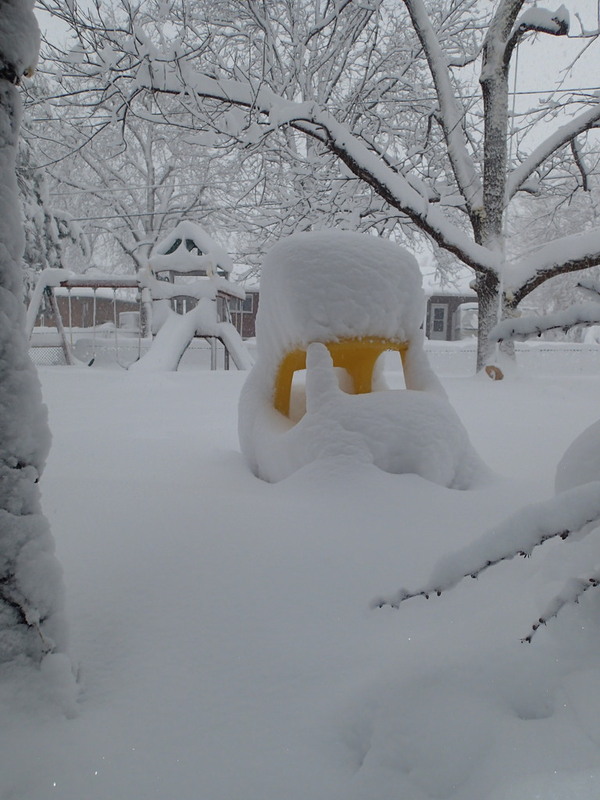 The next day we woke up to a blizzard (18+” by the end of the day!) and were so, so glad we were already home. 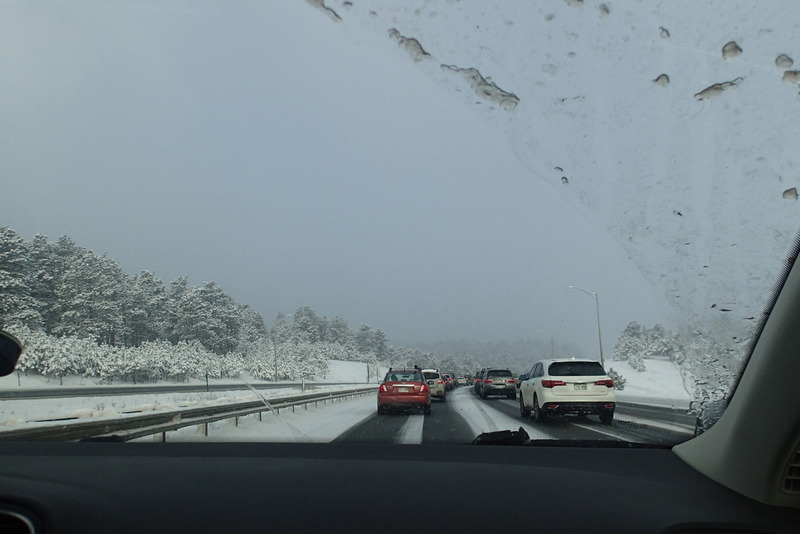 This post made me homesick for Utah, but not for snow. Sorry you were all sick, but I’m glad you went anyway.